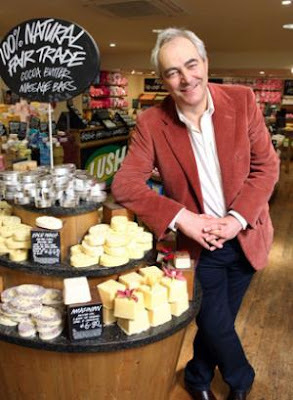 There is a really interesting article about Mark Constantine (the founder of Lush) in today's issue of The Independent. That is really interesting. Less so the eco-stuff he does, but how he started from his bedroom and that he managed to lose 6m in 2 years with a mail order cosmetics business. I am not a big fan of their products anymore since they switched from Palm to SLS, but I do find him inspiring. Oh, and my mom was going to take us some place to have shark fin soup this last visit to Vancouver; I protested and we never went. Such a crazy "delicacy". MP-I saw they has a new soap without palm or SLS. I'm not a Lush junkie, but I do like their stuff. Teresa, well done on your shark fin protest! That's one dish that's never tempted me. Very interesting. I am not an actual fan of the Lush products - they just don't feel nice to me - but I cannot go past one of their shops without being drawn in, like it has an invisible magnet! I just love the way the soap is stacked in great big lots, kind of rustic shapes, and the whole *feel* of the shop. I love Lush bath bombs, and I use a couple of their shampoos, too, but I don't understand the whole 'Cult of Lush' thing. I do think that anyone who sells handmade soaps/cosmetics owes them a huge debt. They paved the way making handmade goods mainstream. Hi Elizabeth..just read this article. interesting..and faith restoring. i have been a lush fan for some years but recently stopped using due to sls (in soap of all things) and the fact i prefer my own. he obvs. has good ethics too though so thumbs up for a very hard-working man. £255m ain't half bad is it?! FP, have you seen their newer soaps? They look like proper CP! no i ain't...shall pop into a shop today. I have to walk past one at lunch time. Can't wait!